We are very happy to present to you Modus, a furniture WooCommerce Theme! 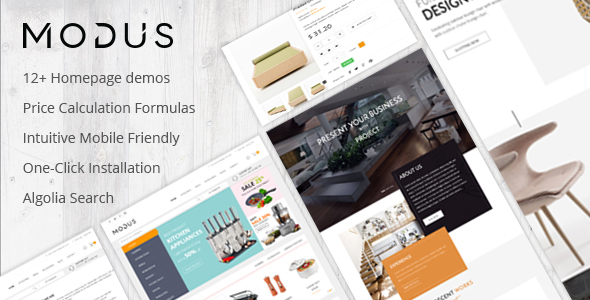 Comes with 12 stunning Pre-defined Homepages, Modus fits for a range of ecommerce website like furniture shop, furniture marketplace, Wood shop, TS Glass shop, Fabric shop, interior shop, architecture shop, equipment shop, and much more. Modus is also based on Redux framework and empowered by a robust admin panel and a lot of other popular plugins such as Visual composer, Slider revolution, Ultimate addons for Composer, WPML, Price Calculation formulas, Mega Menu, Ajax Search, Ajax product filter…. So, it is an assurance that Modus will bring you a super powerful features of WordPress Theme. Uni CPO – WooCommerce Options and Price Calculation Formulas: a fully featured plugin that gives a possibility to add any custom options to your WooCommerce products as well as enables custom price calculation based on any maths formula. The current version includes these types of options: text input, file input, radio inputs, checkboxes, dropdown, date/time picker, range slider, palette select and textarea as well as special types such as heading, divider, note. Uni CPO – WooCommerce Options and Price Calculation Formulas – Save $50: The unique feature of the plugin is that it creates a possibility to use any maths formula in order to calculate the price of the product based on user’s input / options chosen!